Inside a cozy oasis where timeless textures and Scandinavian lines rule. “Put your thinking cap on” was Kassina Folstad’s first introduction to her forever home in St. Paul, Minnesota. Despite the thoughtful warning (really, this was the actual line the real estate agency used for the listing), Folstad and her musician husband had very little issue to take with the property—other than the fact that it had seen four gaudy additions over the years and was totally lacking in natural light. Like most excited designers who stumble upon their dream renovation, however, Folstad eagerly sketched out her plans for the space on the back of a restaurant napkin before they went back to put in their offer. A high-low mix of splurge-worthy materials and chic flea market finds, her home is as much a lesson in mastering the modern farmhouse look as it is in renovation budgeting. Born into a family of seasoned builders and renovators, transforming properties isn’t just a hobby or wise career move—it’s in her blood. Three years ago, Folstad founded OlliePop Design, a full-service remodeling and interior design company she named in honor of her daughter, Ollie, who she nearly lost following complications during childbirth. After returning home from the hospital, Folstad (who formerly had a career in advertising) decided that she needed something more flexible. With more time for doctor appointments and caring for her little one, running her own business proved to be the perfect outlet. At just nine weeks postpartum, Folstad started taking on remodeling projects—including getting back to her own. Since its original construction in the 1800s, Folstad’s home, which she currently shares with her husband, daughter, and two step-children, has seen four inconsistent additions over the years. Between the kitchen and entryway, the pair ended up knocking down seven obstructive walls, installing a steel beam in its place as a support for the vaulted ceiling. In the end, Folstad and her husband ended up rebuilding approximately three-quarters of the house, a process that included projects like carving out space for a proper master bathroom, installing all new flooring, and a complete kitchen redesign. Ahead, we caught up with Folstad to learn more about how her dream home came together, and snagged a few of her “when to splurge, when to save” tips along the way. Renovations can be really daunting for most people. What’s the best mindset to have before jumping into a project that is all-encompassing? My motto with my business is “love your house for less.” I always tell people, I can’t remodel a kitchen for $5,000, but it doesn’t have to be $50,000, either. Even today, I can’t help but think, how much money are we putting into this and how much money are we going to be able to get back? In my kitchen, for example, I’ve got 75-square-feet of countertop and I did it all for $800, but that allowed me to splurge $25,000 to vault the ceilings and make the stove wall the big feature. We spent over $20,000 just on our flooring, but that’s the thing. If I send a cute picture of my kid out, it doesn’t matter. Nobody looks at the kid… they comment on the floor. 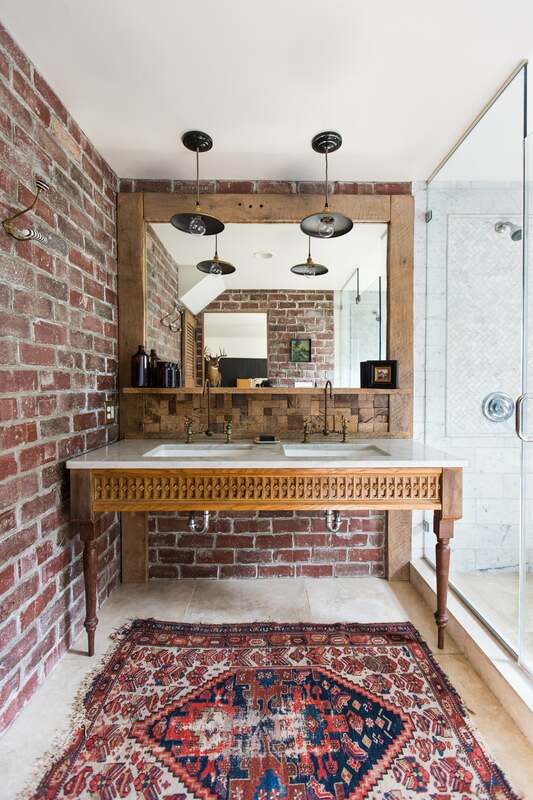 The master bathroom is really amazing. Can you tell me more about how you approached this space? The built-in bunk beds for your kids are genius! Was this something you had always envisioned for them? “The room was long and narrow, so if you just had beds up against the wall there would have only been about a foot and a half left at the end of the bed. It’s like, what do you do with that space? So at the end of the mattresses inside the bunk beds are shelves where our son can keep his video games or our daughter can put all her makeup and dolls. It’s a good secondary play space for them. Now that the space is complete, is there a room where you like to spend all your time? No, I don’t think there is. I have I think our house is a really good example of using space the best that you can for our family and not having the most massive space. Every room is meticulously designed for what we need it to do. Even our office has a 20-foot long desk because my husband has half of it and I have half of it. We renovated our house over the course of seven years so we had time to highly curate everything. Your home is super cozy. Do you have any tips for making a space feel extra warm and welcoming this season? In Minnesota, fall is absolutely the best. The air is crisp and cool, it’s so sunny, it’s unbelievably gorgeous with the leaves turning—it’s probably everybody’s favorite season here. Our wood-burning fireplace is our primary source of heat in the winter. My advice for people is to hunker down and get cozy with different materials and textures. I love the juxtaposition of super modern pieces with something really rustic. For instance, my couch is sleek and modern, but it’s paired with the reclaimed wood floors. Play with natural elements and add tons of layers and textures. It can still be very clean with modern lines without it feeling sterile.